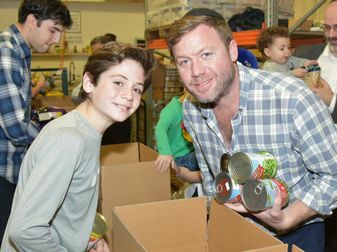 Once again Yad Eliezer was honored to host East Hill Synagogue's Father-Son Bar Mitzvah Mission at our Jerusalem warehouse. Led by Rav Zev Reichman, these 25 dads and sons from Englewood, NJ joined us on a cold Motzei Shabbat to pack food boxes for the hungry. An industrious group, they were able to assemble a whopping 150 boxes in just an hour. This event was not only fun, it was worthwhile and impactful-every helping hand makes a difference. We look forward to hosting the EHS group again, soon!